Drill a small pilot hole in the centre of each section. Technically you could skip this step but I usually drill the 5/8″ holes with the pipe trapped between my feet so the pilot holes are nice. 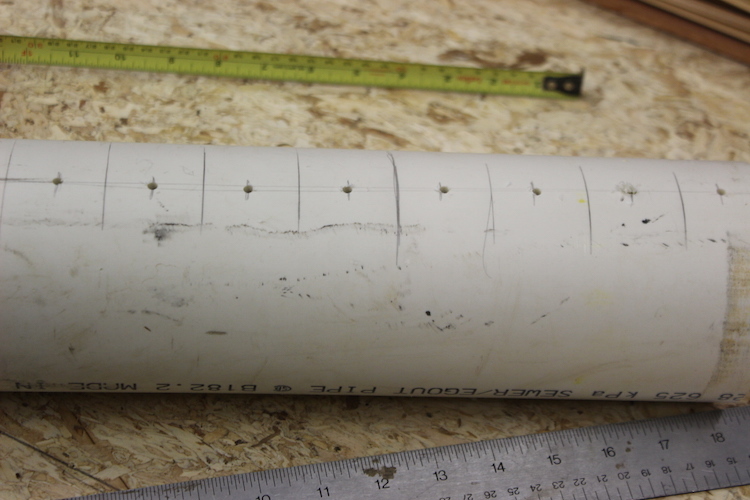 Enlarge your pilot holes to 5/8″. It is best to use a spade bit for this hole. 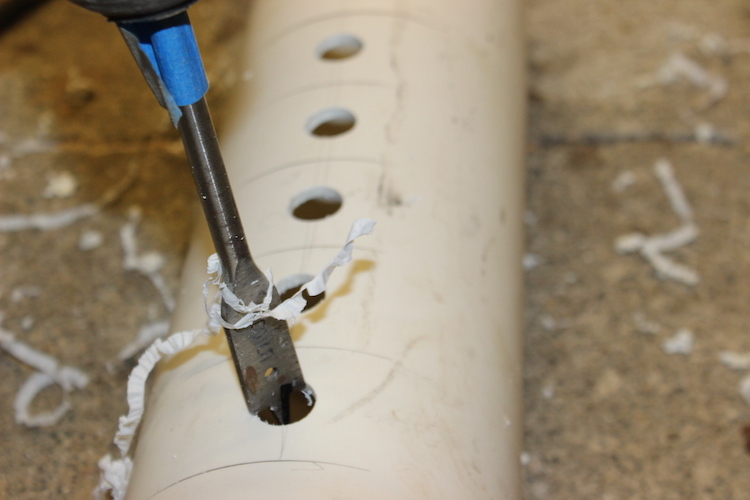 Twist bits drill the pipe so quickly that it tends to grab and torque the bit as you finish the holes. Your wrists will thank-you! Drainage pipe has one flared “bell end” allowing it to fit over the next length. If the pipe has a “bell end”, it is easiest to cut it off first. 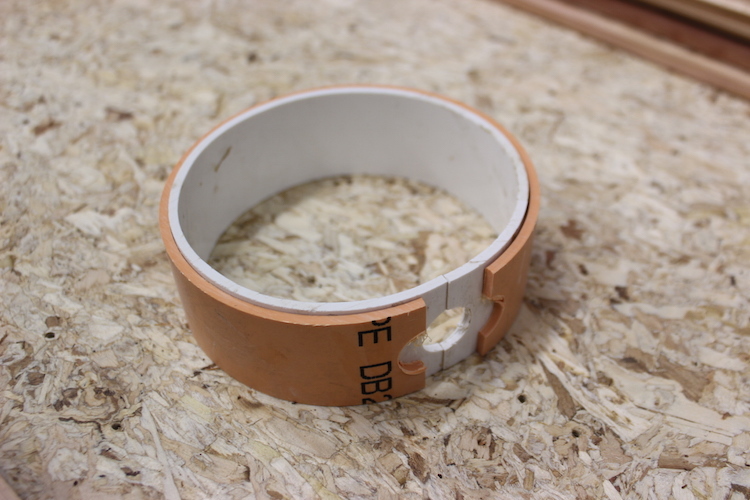 You can safely do this by putting something under the pipe and against the fence of you miter saw as a spacers. This keeps the end of your pipe square. 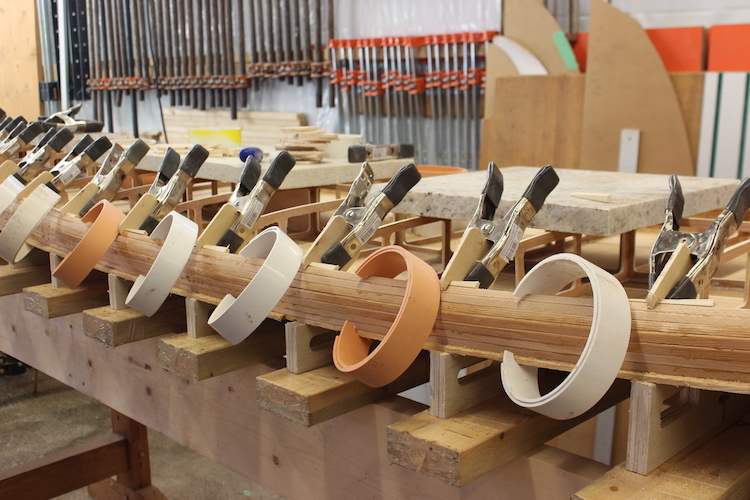 It is important to slice the pipe into 1.5″ lengths before you slice the clamps open. 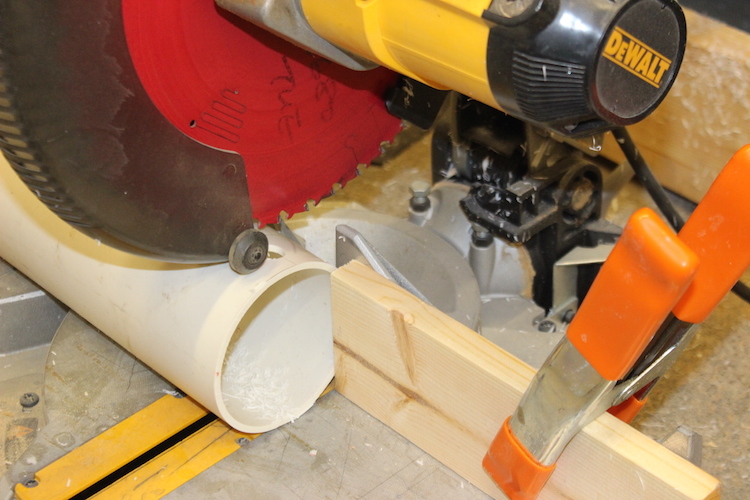 Set-up a stop block on the cutoff side of your saw. This block will perfectly space your rings at the desired length. Having them all the exact same length is a nice touch when you nest the clamps later. 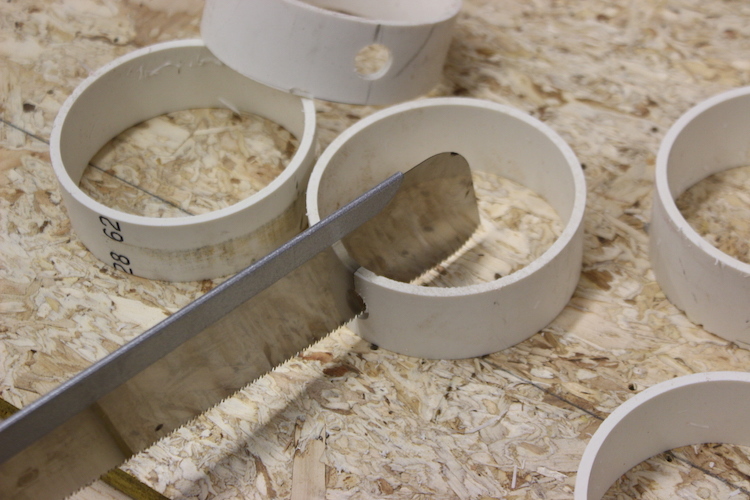 The final step is to slice through the 5/8″ hole to open the clamps. I like to use either a Japanese handsaw or a bandsaw for this step. 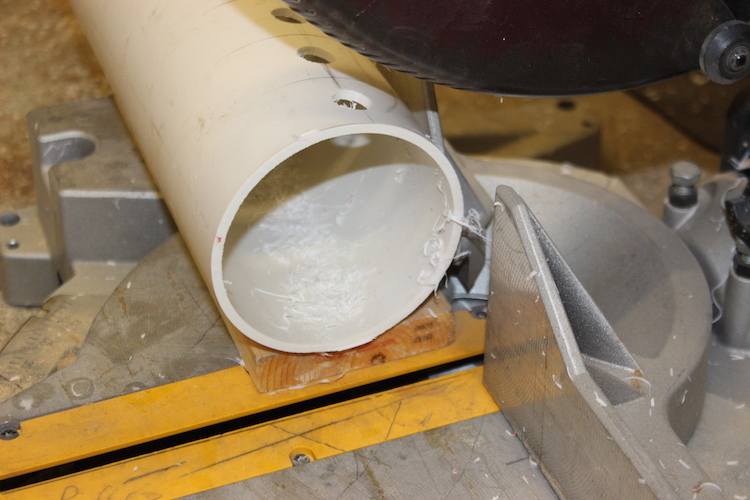 The clamp will want to close on the saw blade as it is cut so be careful if you use a table saw. 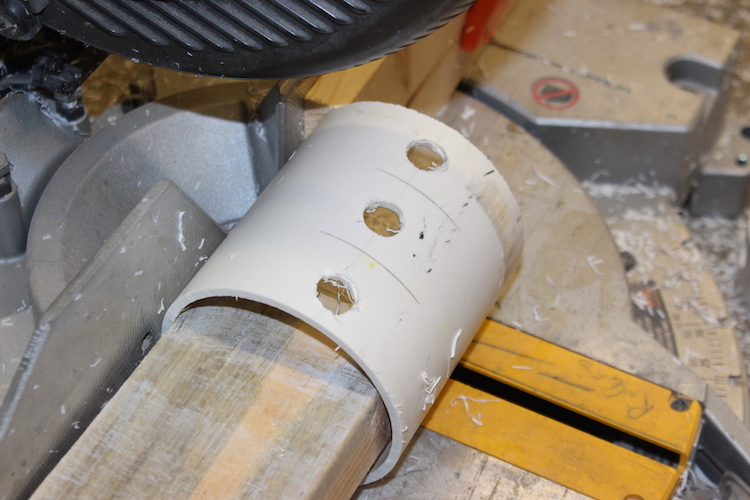 A 2×4 fits nicely inside the 4″ pipe and keeps your fingers away from the saw blade. This allows you to use the whole length of pipe. Schedule 20 clamps are most useful when they are nested together to increase there clamping power. 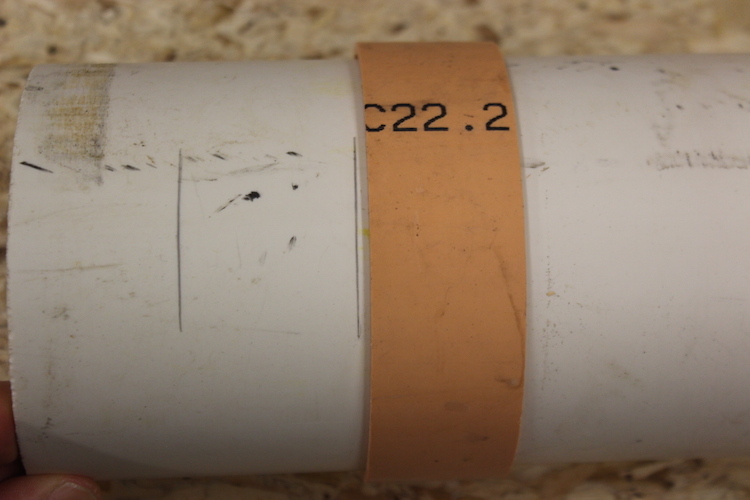 If you are using schedule 40 pipes you probably don’t need to nest the clamps. If you are short on clamps in your workshop you will find these clamps very handy. If you have 100’s of clamps in your workshop you will see that there are some jobs these clamps out perform the rest. Enjoy!